2010 November 15 » Embroidery Talk Has Moved! It’s a well known fact that everyone likes a bargain. That’s particularly true this time of year when everyone is purchasing supplies for their holiday decorating and embroidery. If you’re looking for savings on machine embroidery thread, you should check out the options that EnMart has to offer. Whether you buy mix and match cones by the dozen, or choose to purchase one of our already selected thread palettes, you’ll save money and get a great thread as part of the deal. For those who are of the create your own bundle persuasion, EnMart offers our Iris Mix – N – Match discount. Purchase 12 or more 5500 yard cones of our Iris UltraBrite Polyester or Iris Smooth ‘N Silky Rayon thread and receive a percentage off the original price of the thread. That equals a dollar a cone savings for the polyester thread and a savings of more than a dollar a cone for the rayon thread. The discount begins at a dozen cones, and applies whether you by 12 or 1200. Discounts are taken automatically at checkout and will be reflected as a category discount note in the shopping cart. The second way to save money on Iris Machine Embroidery Thread is to purchase one of our thread palettes. EnMart’s thread palettes are groups of 5500 yd cones of Iris polyester thread that are centered around a particular color family or are designed for a particular occasion. We offer palettes for things like baby gifts, holidays like Christmas, and color family palettes as well. The Iris Thread palettes are available only from EnMart and are priced at a discount from the single cone price. It’s a well known fact that everyone likes a bargain. When you purchase Iris Thread, using either the Iris Mix – N – Match program, or whey you buy one of our thread palettes, you’re not only getting a bargain, you’re getting a great thread as well. 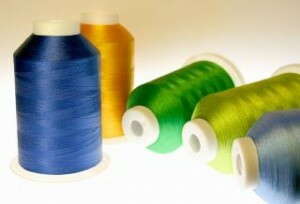 When it comes to machine embroidery thread bargains, what could be better than that?